Beautiful certificate from the Crusade of the Double-Barred Cross dated in 1925. This historic document was printed by Edwards & Deutsch and has an ornate border around it with a vignette of the Double-Barred Cross and a 1925 Christmas Seal Stamp. This item has the printed signatures of the Company's President and Managing Director and is over 82 years old. Christmas Seals are adhesive labels placed on envelopes during the Christmas season to raise funds and awareness for tuberculosis programs. In 1904, Einar Holb�ll, a Danish postal clerk developed the idea of a seal on envelopes during Christmas to raise money for tuberculosis. The plan was approved by the Postmaster and the King of Denmark, and the first seal bore the likeness of the Queen and the word Julen (Christmas). Over 4 million were sold in the first year. They were introduced to the United States by Emily Bissell in 1907, after she had read about the program in an article by Danish-born Jacob Riis, a muckraking journalist and photographer. Bissell hoped to raise money for a sanitarium on the Brandywine River in Delaware. It grew to a national program in 1908 by the National Association for the Study and Prevention of Tuberculosis (NASPT) and the American National Red Cross. The seals were sold at post offices, initially in Delaware at 1 cent each. Net proceeds from the sales would be divided equally between the two organizations. 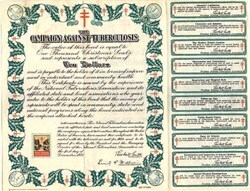 By 1920, the Red Cross withdrew from the arrangement and sales were conducted exclusively by the NASPT, then known as the National Tuberculosis Association (NTA). To reflect the expanding scope of the organization's goals, the name was changed to the National Tuberculosis and Respiratory Disease Association in the late 1960's. The NTRDA became the American Lung Association in 1973, though the 1974 seals continue to show the NTRDA inscription on the sheet margin. Today the Christmas Seals benefit the American Lung Association and other lung related issues. Tuberculosis was declining, but recently has been on the rise. TB is still the most common major infectious disease in the world.